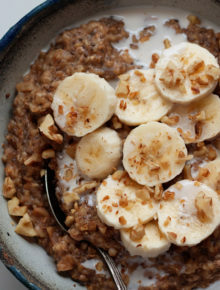 Steel cut oats cook up perfectly creamy in the pressure cooker. 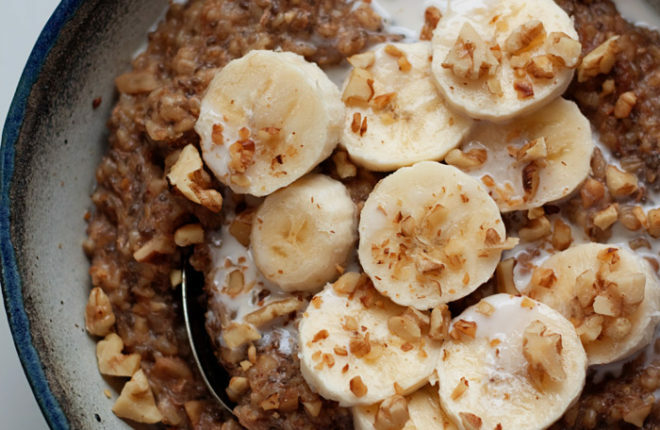 This recipe adds banana + walnuts, flaxseed meal, and chia seeds for a serious omega-3 boost. A few weeks back, I disabled my Facebook newsfeed and subscribed to a print newspaper for the first time in years. Doing both felt remarkably good. It’s so nice to read the news without a bunch of inflammatory commentary, which – as we all know all too well – usually happens online. It’s also nice to know I’m getting my news from a reputable source, and to know I’m supporting the free press during this tumultuous time. Know what else is nice? The ritual of it. I’d forgotten about how relaxing it is to grab the paper out of the driveway (our 5-year-old always helps – nightgown, mermaid slippers, and all), sit down with a cup of coffee, and snap open the paper. Sure, there are some stories here and there that are tough for sensitive-ol’-me to stomach, but they’re pretty easy to pass over in print if I need to. Last week, I found myself looking forward to Sunday morning way more than usual, because I knew there would be a bit fat Sunday paper waiting for us to read while we sipped our coffee. Yeah, it’s a little different with the kiddo right there wanting to “read” with me, but still. Loving it. 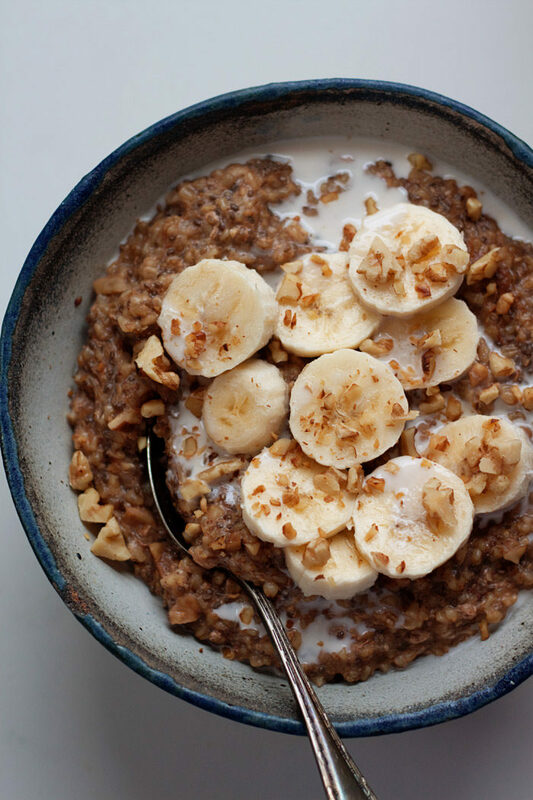 I’ve been making steel cut oats in then Instant Pot for just about as long as I’ve owned one. So, you know, about 4 months or so. But I am in love with how steel-cut oats cook up in the pressure cooker – relatively fast, super creamy, perfect texture. I thought I’d doctor up a batch with bananas for some natural sweetness, plus, for a nice dose of healthy goodness, all of the plant-based omega-3-rich foods I had in my cupboard. 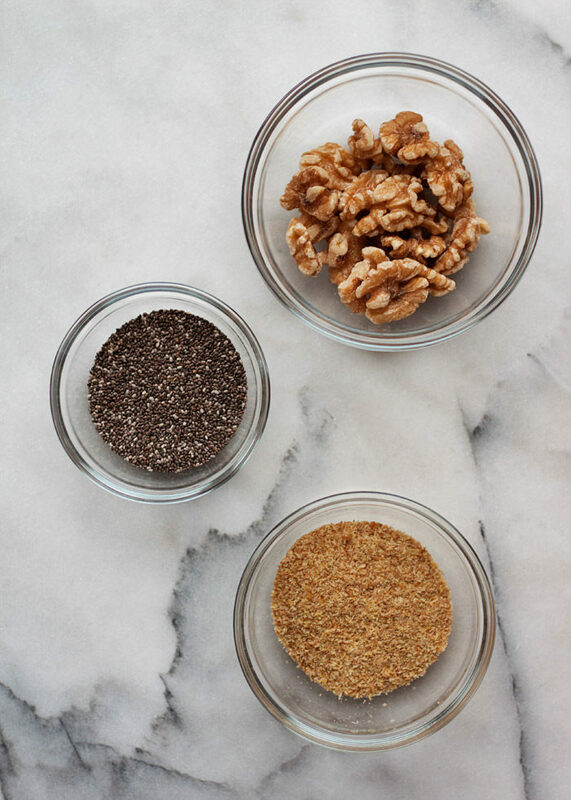 Chia seeds, ground flaxseeds, and walnuts, baby. Done and done. I should note that I’ve never been a huge fan of walnuts (in some forms, they’re probably my least favorite food – and I wholeheartedly believe they should never go near a chocolate chip cookie). But when they’re chopped fine I can tolerate them – and sometimes I even toast up a few to add as a topper. In this recipe, I’m good with walnuts. Tiny ones. Add all ingredients (except toppings) to Instant Pot. Stir to combine. Place the lid on the pot and make sure the release valve is in the “sealing” position. 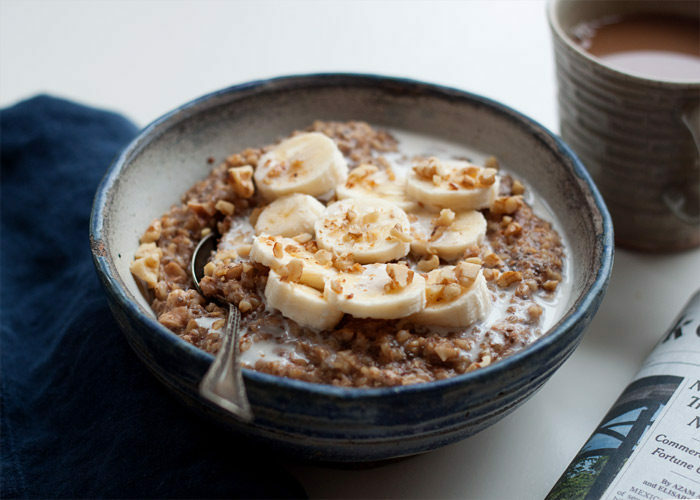 Scoop oats into bowls and serve with optional toppers if desired. Leftovers keep well in the refrigerator for up to 3 days. I love keeping extras in the fridge for super-quick breakfasts. * If you’re on a gluten-free diet, be sure to use certified gluten-free oats. ** Feel free to reduce or even omit the maple syrup, depending on how sweet you like (or don’t like) your oatmeal. NOTE: I’ve been getting a few reports of a burn warning popping up for some people who try this recipe. It seems to be happening in Instant Pots that are larger than mine. I plan to do some more testing; meanwhile, a suggestion is to try doubling the recipe or increasing the liquid a bit. Hi Anna, I’m not sure how other pressure cookers work but for my Instant Pot, I set it to 10 minutes and then it does spend some time building pressure/warming up before the 10 minutes kicks in. Probably about 15-20 minutes total. How big of a pot are you using for this recipe? I have a 3qt. And would like to attempt this this week. Thank you. Mine is a 6 quart, though it isn’t very full with this one. I tried this recipe this morning and it is delicious. I appreciate the added Omega 3s. I’m new at Instant Pot cooking so I may be doing something wrong. However, my steam valve never popped up. I had the seal properly seated but basically, mine cooked but really did not pressure cook. After letting it sit for a few minutes, I turned it back on on manual for about 5 minutes but again, it did not pop up and did not pressure cook. Ideas? The manual said this can happen when there is insufficient stuff in the pot or the seal is not properly seated. I’ve had this happen before, it’s so frustrating! I’ve been able to solve it by removing the seal in the lid and really scrubbing the Instant Pot. I also remove the steam valve and wash that completely too. I hope that helps. Same thing happened to me just now. Never sealed and burned on the bottom. Although the oatmeal was cooked and tasted great. I’d love to make this recipe! I’ve used my slow cooker and a pot on the stove for steel cut oatmeal, and I’m brand spanking new to my IP and just took it out of the box. I don’t have almond milk though, could I use regular cows milk instead? Or is that a no-no in the IP? Thank you for your help! Hmm, not sure about the burn warning, I’ve never seen that! I would think extra liquid would take care of it. So weird. I’ll look a bit more into it and see if I can learn more. Okay, well that’s weird. I guess I need to do some more testing with this recipe! I tried this recipe and got the burn error. Disappointing. Can you please tell me exactly which model of Instant Pot you have? I would love to get to the bottom of this problem! I have the 8qt Duo. I am also getting the burn error. I am wondering if it is because I have the 8 qt and the recipe is tested in a 6 qt? Ugh, so sorry! Thanks for letting me know which Instant Pot you have. Looks like I need to order another and do some more testing with a newer/larger model. This tastes amazing!! My whole family loved it. Ran into the same problem with instant pot, it said BURN and wouldn’t finish cooking it. Thinking almond milk maybe the culprit. Finished cooking it on the stove and it turned out great. I’ll try again, anyone figure it out yet? I used a 3 quart instant pot and substituted whole milk. I’m new to instant pot and don’t know what a “burn warning” is. I didn’t see anything unusual as it cooked, but it did burn on the bottom. In a few seconds, it started working. It might have been because pressure was too high. It still scorched the bottom. And the oatmeal was too think after completing the 10 min on porridge on low pressure plus 10 min natural release. Just a suggestion for those of you encountering the sealing and “burn” message issue, try the recipe using the “pot-in -pot” method with use of the steaming rack. Basically, one cup of water in the pot, add the steamer rack, then put all steel cut ingredients (except the toppings) into a stainless steel bowl and put that onto the rack. Pressure cook for 10-12 minutes. This is how I have been doing my oats and it works great! Also doing the pot-in-pot method results in easier clean-up. Great idea! Thank you! I’m going to try this in my new IP too. Thanks again! So, i’m Trying this now. I have a 6qrt Duo plus. I’ve made steel cut oats before and because of the 2Tbs of chia seeds (that absorb a LOT of liquid) i’ve Added an extra 1/2 cup. It’s on “delay timer” for the morning rush so i’ll Let you know how it panned out in about 12hrs from now. Ok, I did 3+1/2 cup of water (no flax as I was out) and did delay timer on the “porridge” setting. I let it naturally release the pressure for 20mons. Opened it up, gave it a stir and perfect! Well, almost. I like my oatmeal a tad sweeter so I added extra maple syrup on top of the toppings. But the overall cooking/end product was fine. Great recipe. I made this in the instant pot. 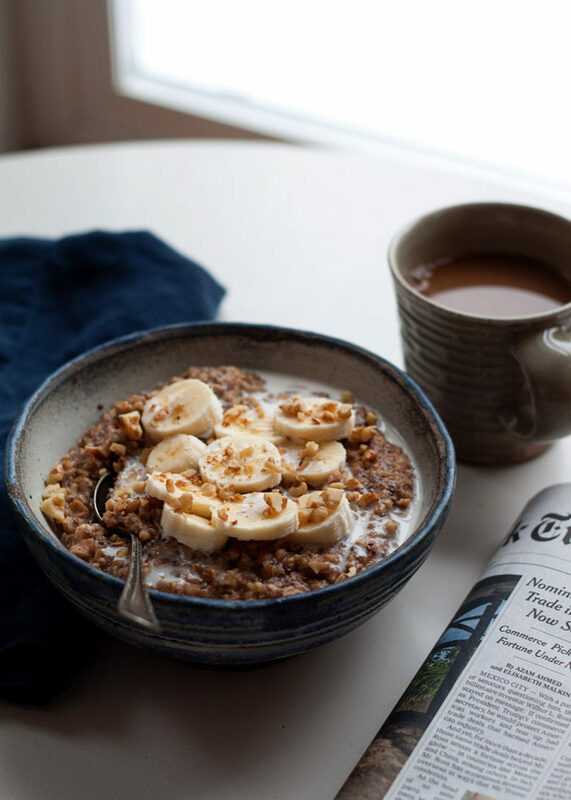 I substituted unsweetened vanilla coconut milk for the almond milk and pecans for the walnuts. I eliminated the Flax seed and the vanilla. We topped with some fresh blueberries. It was easy and DELICIOUS! I’ve made this a few times and haven’t gotten the burn warning (my IP is an older one), but I don’t cook it for 10 mins. Instead I cook it for 4-5 and then let the pressure naturally release. I still get a slight cooked layer on the bottom so I can’t imagine cooking it for 10 mins. Delicious healthy recipe by the way! For breastfeeding mamas, this is actually a great lactation recipe with the oats and flax- I just add brewer’s yeast after it’s done cooking. I also stir in peanut butter before eating! Oh, good point about it being lacation-friendly! Maybe the result of people burning their recipe is from your instructions and #2. You state to use the manual button and set timer to 10 minutes. Once the 10 minutes is up, quick release by flipping the valve to “venting”. Worked perfectly! Had a bit of sticking to the bottom of the pot, but no burn error. I stirred the oatmeal and most of the stuck stuff came up!